provides all opportunities for a perfect holiday. This pages offers you many helpful suggestions and tips for your holidays. 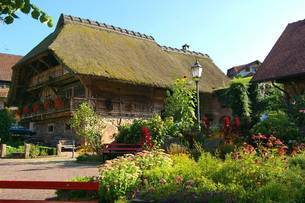 Here in the Black Forest you can find comfortable hotels and family operated pensions which enable an enjoyable stay in your holiday-residence. There are hotels available in all categories. Vineyards offer bed and breakfast accommodations such as holiday flats or homelike rooms. Especially for children, holidays on a farm are great! Spend your holiday with the ranger in the forest – a special experience of nature! You are living in a cottage that is operated only by candle light. Bad Peterstal-Griesbach and Bad Rippoldsau-Schapbach invite you to a stay for a cure or for taking a bath. Around Oppenau in the Renchtal mountainbikers and wanderers find their paradise. The romantic little city Gengenbach with its gates and towers offers an unique ambiance. In the summer you can accompany the night-watchman on his patrol through the alleys originated in the Middle Ages. Visit one of the numerous vineyards of the golden wine village Durbach and taste the excellent "Durbacher Klingelberger" and other exquisite wines from Baden. A stay in Sasbachwalden - the village of wine and flowers – will inspire you. The world-famous spa in Baden-Baden is located at the western border of the northern Black Forest in the valley of the river "Oos". Even the Romans already used the curative hot sources in Baden-Baden. 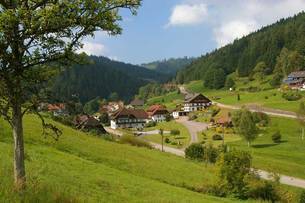 There are many interesting destinations in the Black Forest: In the Achertal it is worth visiting Ottenhöfen - the village of mills. From Sasbachwalden you can reach the "Schwarzwaldhochstraße" and the lake Mummelsee within a few minutes. The highest mountain of the northern Black Forest is called Hornisgrinde with a height of 1164m – a real paradise for hiking. On your way through the Renchtal you pass the waterfalls of Allerheiligen and the ruin of the corresponding monastery and you reach the "Schwarzwaldhochstraße". This oldest German vacation-road starts in Baden-Baden and ends after 60 km in Freudenstadt. Naturally you should also visit Freiburg and the lake Bodensee. And if you spend your holiday in the Black Forest it is absolutely necessary to visit the neighboring Alsace with its cities like Strasbourg, Colmar and the picturesque villages at the foot of the Vosges. For sportsmen the Black Forest recommends itself as a paradise for mountainbiking and nordic walking. Well designated trails with all levels of difficulty lead mountainbikers and nordic walkers through the forest and the grassland. The paths often lead directly to bed and breakfast accommodations such as hotels or holiday flats. Paragliding can be done in Oppenau.